From the first day I am in Beijing, I planned to visit the new Adidas flagship store in Sanlitun, Beijing. I am not a sports fan, and I am not an Adidas fan yet. I went there just for the building. When we were at a bar at floor 4 of the Salish Lodge in Snoqualmie, Greg told me that he has a new architect completed in Beijing. This is one of the only three works he did for Asia. I went there and check out his building. In Beijing, almost everything related to household utility is prepaid. This is the biggest difference in life in Beijing and Shanghai. In Beijing, things are very different. – Electricity card. You have to go to bank or self-serve machine to buy electricity credit, and then insert it into the electricity meter to get electricity. – Gas card. The same thing. Buy it at bank first, and insert the card into the gas meter, so you get gas. – Hot water card. You have to got to the property management company to prepay the hot water you need, insert it into your hot water meter, so you can get hot water. If you do not insert the card, the meter just stops anything from passing it – no matter it is electricity, gas, hot water, or anything else. I just feel the pain in Beijing, but there is no right or wrong. It is just different from Shanghai, just like many foreigners felt the difference and suffer from the difference from their own country in China. What do you feel about the prepaid model in Beijing? I went to Wendy’s high school gathering in Beijing on Sept 28th. For many classmates, Wendy haven’t seen them for 13 years. Time flies. Here is a nice photo after the dinner. Me? I was the photographer. In the Pike Market in Seattle, I bought a small apron skirt for Yifan. That was a very small thing that I can put into my pocket. The lady who sold it to me gave me a large plastic bag, and I immediately said: “Oh. No. Thanks…”. When people travel, and maybe only when people travel, they can be more sensitive to the world, and found out something that they didn’t think before. Free plastic bags for retailer besides food have been banned in China for quiet some time. (beforeand after the ban). I, and most of people in China, has gotten used to a world without plastic bag. People start to bring cloth reusable bags to shopping already. The free plastic bag in Seattle, and in most of other places in US was very different. I am back from Seattle. The trip was very long – left hotel at 7:00 AM Sept 22 Seattle time, and arrives at home at 8:00 PM Sept 23 Shanghai time. That is 22 hours on the road – to be more exactly, on the road, at airport and in air. I agree that Seattle is too far away. I have get used to my trip to the Bay Area. That is more convenient compared to Seattle. I have not been to Seattle since 2005, when I left Microsoft. Title 9 – what is this? Women in sports as background of what she did – much better cause to do things. 30 years of reform since 1979. You are going to spend all your time as a tourist. “YOu can have it all, but not at the same time. We all make choices”. Kennedy: “our bank system is at its edge.” Thank God. They didn’t listen. The key is to have a “clear, rational, and not self-centered propose”. “Stupid enough ot think that would work” – for culture revolution in China. “Something upset us is not the real world, it is our thought about the real world”. – They are the only game in town. Who are you for if you are against them. – This is the most successful regime in human history. Growth and development of economic system – painful process. Travel is interesting since it gives you the chance to understand the silly things we do everyday. People in US always use energy to make it cold. I just cannot bear that everything I drink is cold. Not only “not warm”, half of the water in the cup is “ice”. I didn’t think about my love to hot water too much before I realized American’s love to cold water. The even more serious energy waster is the drinking machine in Shanghai. Many drinking machine has hot water on the left, and cold water (cold, not normal temperature) on the right. Many people just mix the hot and cold water to get water that is directly drinkable. But why waste the energy to cool it and heat it, before they are mixed? After we have dinner with D-WA congressman Rick, many of YLFers head back to hotel. I went to a Salsa dancing place in Seattle with Ashish, Tong, Ming, Mark, Lisa, Raymond, Matt, Jen…. (many people, and I just try to use first name – the typical way I quote people when I don’t have their explicit permission to show their name in my blog). The place is called Century Ballroom and Cafe at 915 E Pine St., Seattle. Nice place. I was very impressed by how well everyone in the ballroom dances. I didn’t bring camera with me but you can check out some sample photos they posted on their own website. It was amazing. I am familiar with places of disco dancing, but for ballroom dancing, this is my first experience. It seems people have a pretty high basic standard to join the dancing pool. I didn’t dance, but just looked quietly for one hour. The dance itself is a performance for me. Seattle is a charming city. It was always my favorite US city, before I later started to love life in the bay area better (not that much rain, and the faster pace, more relaxed startup environments, and the great minds I can tough). Besides the natural beauty, Seattle is particular outstanding in terms of art. I saw more art display in Seattle than any other city. I watched drama in Seattle, and it was wonderful. I reported the grassroot art in Seattle about the Live Girls Theater, and the draw exhibition, which directly inspired and led to our photo exhibition in Shanghai. To me, Seattle’s art is more grassroot than New York, and more appealing to me. Tonight is another example of those very well done “art” – the dancing of normal people in this city. I decided that I need to put “learn to dance” to my to-do-list. The other event that triggered my interest in dancing is a very quick introduction of ballet by Damian Woetzel, one of the greatest and brightest star in the modern ballet field, during the session this afternoon. Sometimes it really matters about who teach you something more than what he/she teaches. The inspiration, I think, will last for quiet some time. Written at 1:36 AM, Seattle time. During this trip to YLF, and recent other trips in US, I just realized in more and more occasions, my name is printed as Wang Jian Shuo instead of Jian Shuo Wang. If you didn’t noticed the difference yet, let me tell you explicitly: it is all about first name first or the last name first for Chinese people. I write about Why I don’t have an English Name 4 years ago. If you don’t have the time to read that long article, the quick reason is about how you can legally proof that you are the person identified by your English name. But in the last few years, more and more I feel a Chinese name is all about the Chinese identify that I feel very comfortable of. The order of the change is a small change, but it means something significant to me. When we translate someone’s name from US to China, we keep the order. Bill Gates is translated to directly to Chinese using pronunciation, and the Gates part always comes after Bill. I cannot think of any scenario in China that people address Bill Gates as Gates Bill… The only transition from the last few decades was, there was to be a dot between the Chinese translation of first name and last name. Now, the dot is used and still regarded as the right way to do it, but fewer and fewer people will need to add the dot. Maybe because it is not directly in the keyword or easy to access via Chinese IME. For the same reason, the translation of Chinese name to English seems easy. Pinyin is already a great way to do the word to word translation, but why Chinese name has to be put upside down to fit the English standard? I didn’t think about this until recently I saw my name more and more often printed as Wang Jian Shuo. It at least reflected that the culture and people exchange in the two countries (or more countries) are more frequent. Just as people in China don’t really need the dot or even dash to help get the first name and last name apart (because the names are very family to many people already), people don’t need to change the order of Chinese names to fit the English tradition, since people will gradually know how that Chinese names always have surname first and given name last. Let me first post this photo Robert Yung took during our stay in Salish Lodge. The point where the photo was taken is very close to where we stayed. We had great fire-side chat before dinner last time, and Ashish again, took the photo of us when we were there. In the photo below, we have Yuan Ming, Zhu Tong, Alex Liu, Ambassador Chen Yonglong, Tang Haisong, Liu Tianyu and Zhang Pei. This is the rafting scene. I finally jumped out of the raft to get the paddle (which is the goal of the rafting), and when I get back, the raft is already far from the bank. So I had to swim a little bit to reach the boat, and get pulled by my team mate out of water. I am completely wet. There are a lot of fun, but the key part is not the boat thing. There are much more than that, and I am going to share quickly. Just get back from the river floating of Snoqualmie River. I am still waiting Ashish to send over the great photos he took when we were on the boat, let me tell you something about the wonderful experience. The water fall of Snoqualmie river is just at where we stayed (Salish Lodge). I could not believe how close a resort can be with a big water fall like that. We took the big raft for 6 persons down to the river. The water is cold – believe me. It is not as the water where Titanic sinks, but it is really cold. If I would tell you that the experience was educational or I learned a lot, I just be lying, but it was really wonderful time to be on top of a calm river (at the later part when we were away from the rocks) in a boat, and to really spend time to discover how beautiful the natural can be. Just finished the first two sessions of YLF (The Young Leader’s Forum) this morning. It is a wonderful presentation, and I am so happy that I have get rid of my jetlag, so I can concentrate to the presentations, and join the discussion. There are so many things that I want to record, and then discuss about it, but let me just quickly move the following bulletins from my note to my blog, because I am very sure that this blog last longer than paper. – People are always trying to be greedy. Since there are so many things to talk about, and there are so limited time – 10 minutes, I just wrote 5 slides, and it worked well. I am presenting this Top Commenter of the Last 6 Years award to a group of unbelievable persons. In the last 6 years, my readers are with me and created this great community to talk about important things in life, setting a bridge between China and the rest of the world. These people wrote most comments in the last 6 years, since Sept 11, 2002, to Sept 10, 2008. The first line of the list is the name of the commenter, and the number behind it are the number of comments this person posted on this blog in the last 6 years. As you may already realize, two or more different users may use the same name, I have a small feature that use different color to represent different email addresses (without disclosing the email addresses) for the same name. Click the name to see their comments to find it out. I ever thought about whether I should use email address to sort and count, and then map it back to display name. Finally, I think, since the blog is all about share and contribution, it does not matter to have many people rewarded under the same nick name. In the case of my blog, most of the comments of the winning nickname are posted by the same person. When I celebrated my 6 years of blogging, I said I do want to do something special for this community. There is at least one thing I can do – to get a small award to my readers who contributed so much to this blog to make the conversation going, so it is not a one way street. For many topics that I don’t have enough knowledge on, I just started the thread, and my passionate readers completed the rest. What is wonderful. Congratulations for this “Top Commenter of 6 Years” Award. I am of type ENFP (Extraverted iNtuitive Feeling Perceiving) in my MBTI testing. (If you happen to know MBTI, you know what I am talking about. I believe in it a lot). – who want to keep possibilities, instead of fixed. – who want to understand the world instead of control it. I typically don’t have schedules. 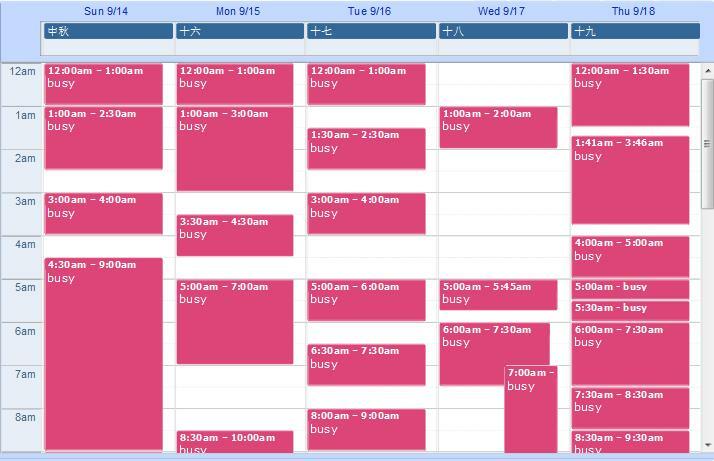 However, in US, without a schedule, it is really hard to do anything. – You need to make appointment with everyone you see. This is obvious, and not like in Shanghai, you can call someone and meet somewhere at the street corner or at a metro station, in CA particular, people need to drive long to meet. – You need reservation whenever you go. You just don’t want to drive 10 miles only to find out there is no room there. It is especially bad when you have some people coming to the same place. – You need reservation to pick up your cars, and return your cars. – You need to plan very well on hotels, and restaurants, since the experience for a pre-arranged stay is excellent and they have everything setup for you, but walking-in, in contrast, is often very chaotic. I cannot imagine I have such a calendar in Shanghai. Filoli – what is this? Should I read it as (Filoli garden) (omelette), or (Filoli) (garden omelette)? Among “(Wild mushrooms, onion, zucchini, tomatoes)”, I only recognize mushrooms, and tomatoes. What is onion, and zucchini? Actually, it is pretty simple to understand what they are just by spending some time. So I have made a decision to learn the menus, and to understand what everything is before my next US trip. I am sitting in the lobby of the Arctic Club Hotel, Seattle. This is a nice historic hotel in downtown, at 700 3th Ave, Seattle. Since I still have 1 hour before YLF car pick me up, I think I should take the time to write down some of the thoughts during my US trip so far. I will beginning with the experience I gained from this trip. I love Renaissance Hotel in Beijing, I love Shangri-la in Beijing, I enjoy the current hotel I am staying, but on the money wise, I seem to enjoy cheaper hotels with easy parking, like Super 8 in US, or Hanting, Rujia in China. The good hotels have too much to offer. I will definitely choose a better hotel when I take vacation, but for business trip, and for sightseeing, I don’t need too much of the facilities.The only thing I need is a wireless or wired network, and a bed. Next time, I am more clear about what I need. I don’t know why, but I am still not in a phase to feel comfortable to stay in expensive hotels, if I pay it by myself or by my company. After visiting bay area, I enjoy so much about having a car and stay somewhere near highway. Although it is far from downtown, I enjoy that life. I drove from Seatac airport to downtown, and suffer a lot. I parked my car on the street, but need to wake up early enough to drive it away, and send them back to Avis, and then get back to hotel again. The other problem is, when I check out my room at 12:00 PM sharp – they don’t allow late check out today – I have to sit in the lobby. Not a very good idea. Next time, I will definitely avoid city downtown if my main destination is not city sightseeing. Just back from dinner at Maple Garden Chinese Restaurant at 14725 NE 20th St. (really bad food in standard of China standard). Get back to hotel. Pretty tired. Pardon me for the short and not-in-detail style. Will add more later. Get to bed now. I went there the next trip, but still, too many people. Again, I gave up. Today, I finally entered the restaurant. It is not empty but still have several seats – BTW, is this another sign of US economy slow down (if not recession)? I ordered something worth of 10 USD with a very long name. I thought it is something big. I was given a salad with eggs, and green leaf plant (remember that I said I am like a rabbit? I feel the same thing again). I ate it, and waited for my main course. What? I was completely lost. I was still starving. If I had known it is salad, I should have avoided it. Then I ordered a pie, and that is really good. After the lunch, my stomach is half full, and completely cold. “Hey, where is the nearby Chinese restaurant, or at least Pho?” I really wanted to grasp someone and ask. yeah…what about China? Hmm….well let’s see. How about more than a 100 children with kidney stones from contaminated milk powder in yet ANOTHER contaminated food scandal? This doesn’t catch your attention, WJS? Let’s face it, there’s shady companies all over the world, but contaminating food for children seems to be something the Chinese particularly excel at. Assuming they’re able to eat anything from underneath the rubble of buildings that government safety inspectors didn’t bother checking, in an earthquake prone zone. So does the pile of bodies…. I always love reader’s feedback about what I should write about daily, but please don’t force me to write anything or claim that I am ignorant if I don’t write something. Let me take the chance about my phylosophy about topic choosing. 1. Writing on something means I care. 2. Not writing on something does not neccessarily mean I do not care. There are many reasons I don’t write for something. Obviously, my blog is not a newspaper, in which lack of important news or attention itself is a mistake. I am not creating a newspaper. They key reason I don’t write on something that I care is, I just don’t feel my value in writing about it. This tag line is not well noticed, and didn’t change from 6 years ago, but it is an important guideline for me. 1. Around me (may not neccessily be in Shanghai – that is where the parath is all about, which means optional, but it has a strong Shanghai focus. 2. That it has affected my life directly, which means, I only try to write on something I have first hand personal experience. Sometimes I write about things that affect others (without first hand experience), but it is not I am good at. For the Poison Milk problem, I do care, but there is not too much I can say about. Maybe not everyone agree, but I think there are enough “opinions” almost everywhere in this world, but there are too little “facts”. People are good at talking opinions before verifying facts. This blog is about the life of a real person – what he sees, what he does, what he hears… I am trying to use a completely different angle than a newspaper – the angle from the eyes of a normal person in Shanghai – to see and report this very small part of the world. (To be more clear, there are 5 billion definition of “world” by 5 billion people in this world. My world is just 1/5 billionth of it). 1. I know someone who are directly affected by it and I have talked with him/her. 2. I observed the untrust in food, milk, water, medicine, or anything that goes into people’s body spread out around me. It is happening, and that is the reason I MAY write about it. 3. Someone post a comment on this blog and ask me to write about it, and I am indirectly affected by it. That is how the article you are reading at comes from. Meanwhile, please don’t feel bad about posting comment like Brian did. It is completely fine. Don’t worry. I am not offended at all. It is very fair to ask for that type of article. I just want to take the chance to clarify again how I choose topic, and clarify that “not writing does not mean not caring” and when “not writing” happens. Two days after I arrive at the bay area, I still didn’t see anything wrong. I arrived in Saturday, and has a bunch of meetings in San Francisco. Everything seems great. Now, it is Monday. However, some chat with my friends today is all about negative news. I may be too late on news, but I just heard about the bankruptcy of Lehman Brothers. I just heard it 10 minutes over coffee from my old friend in eBay. What? What is happening. Then I realized the Dow Jones dropped by 504 points, the worst since 9/11. It is a bad day today. How interesting that my first meeting tomorrow will be at Lehman Bros’ office. It is a awkward situation. How about the meeting tomorrow? But there are much bigger question to ask beside my little meeting: What’s next for the US economy? I haven’t experienced recession in my life time. The China economy just keep growing in the last 30 years since I was born. There are some problems, but not as big as US recession this time. My friend told me that Americans just cut their spending, and don’t pay for many things. They don’t buy new things, they don’t have expensive dinner (or even don’t dinner outside), and they don’t plan for vacations. (By “Don’t”, it really means less). Jobs are cut, and the cloud just appears to be everywhere. To add a note to this, yesterday, I had appointment with a friend at Starbucks, 1 Market Plaza. We went into the building just to find out the coffee shop has been closed. It just echos of the news that Starbucks is closing outlet because people don’t buy expensive coffee as often as before. It seems people in American is tied more closely to economy and finance world than we are. I still cannot understand what is going on now. Would like to hear what do you think about it. And, the question is, what about China?